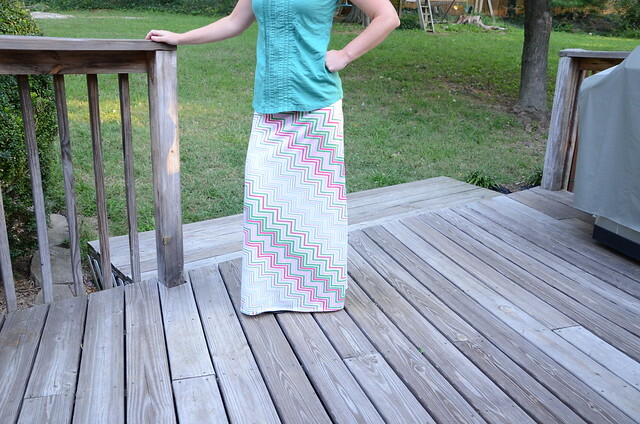 I made this skirt several weeks ago, but never could find the time to photograph it. Well, I had a nice post planned for today so that you guys wouldn't think that I had given up on blogging. Then at the last minute it fell through. I am still hoping to have it up in the next few weeks, but we will see. I decided to wear the skirt this morning and have some quick photos snapped, so that I would have something to share here. Miller took these photos for me and I didn't realize I looked so mad until I uploaded them onto the computer. Anyways, back to the skirt. I have had this fabric in my stash for at least 2 years maybe even longer. I finally decided it was time to use it. 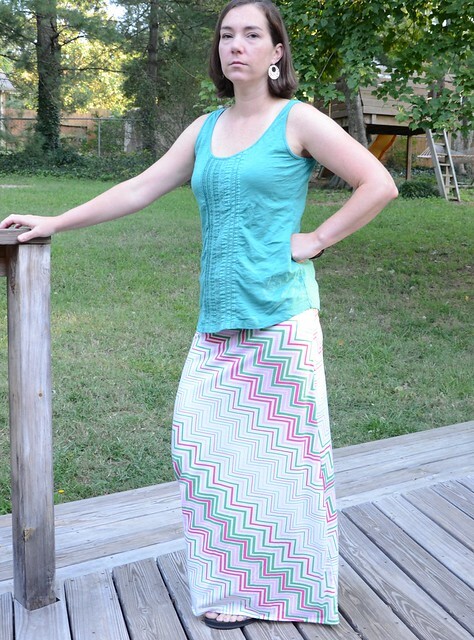 I followed this tutorial and had the skirt finished in an evening. I didn't have quite enough fabric to make an extra wide waistband. I might end up adding some elastic to the waistband because it is starts getting droopy by the end of the day. We have been working on the former TV room. We decided to make it into a playroom for the kids. We painted the walls, trim, and ceiling last weekend. So now we just need to get a rug and some window treatments. Then decide which furniture is staying and what is going. The plan is to have a garage sale this weekend. If we can get rid of some of the stuff cluttering up my house maybe I can FINALLY have my house looking half way put together. That looks great on you! You don't look mad, just tired. I look like that pretty much every morning, too. ;) Does your fabric have a good amount of lycra in it? I think that is the problem with some of those foldover waists...the fabric doesn't have enough lycra to give it staying power. That's why I usually put in elastic bands for mine. Can't wait to see how the house is turning out. You guys have done a lot of work this year! Well you are looking so much elegant in this awesome dress...your choice of sea green shade is very soothing to my eyes really....just feeling blessed to be here really...thanks!!! I will be really thankful for the author of the post in making this lovely and informative article live to put us. We really appreciate ur effort. Maintain the good work. Thesis writing involves several processes which makes the entirety of the experience both exciting and challenging. From choosing a researchable topic that has not been done by other students and eventually narrowing it down to become a uniquely original work to soliciting the help of a research supervisor and in embarking on data collection and writing the paper, these are some of the tasks that almost all undergraduate and graduate students working on a thesis consider as stressful. In spite of the many challenges that students have to put up with, undeniably, the thesis project is an important project-based and challenge-based educational experience that helps in building character and in preparing students for their chosen career. One particular skill that is indispensable and which perhaps is unknowingly cultivated among students as they work on a thesis is the ability to work with a group of superiors. Hello Webmaster. I truly just like your article and the web site all in all! The piece of writing is actually very plainly written and without difficulty understandable. Your current Blog style is amazing as well! Would definitely be awesome to learn exactly where I can get that. If possible maintain up the excellent job. We all need much more these website owners such as you on the web and also much less spammers. Fantastic man!